Crescendo Biologics develops potent, multi-functional Humabody® therapeutics with a focus on novel targeted T-cell engagement. Using our proprietary transgenic mouse platform, we have created a tumour-targeted T-cell engager mechanism capable of activating T-cells only in the tumour microenvironment. Our ability to configure unique therapeutic formats allows Humabodies to engage targets in ways that generates new biology through novel target engagement. Our transgenic VH platform enables us to create an almost limitless number of mono- and multi-functional constructs capable of engaging therapeutically valuable targets in a way that is fundamentally different to whole antibodies. Our unique tumour-targeted T-cell engagers deliver safe, highly potent cancer killing by activating only tumour-specific T-cells within the tumour microenvironment. Their superior biodistribution through minimal size, enhanced tissue penetration and tumour accumulation has the potential to deliver greatly improved therapeutic index through both enhanced safety and potency. 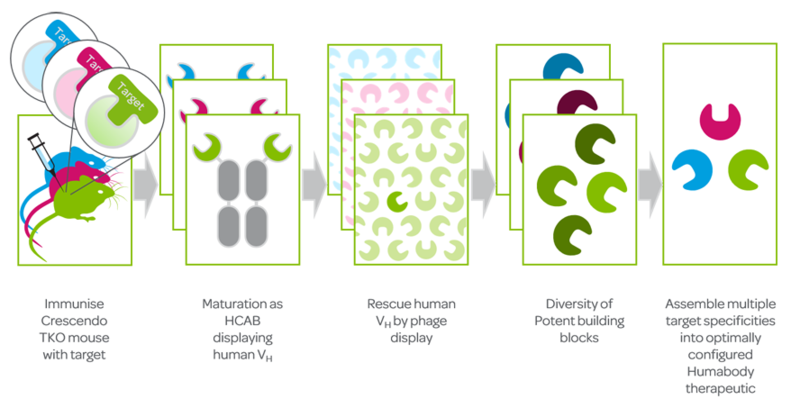 Patent-protected transgenic VH platform facilitates rapid assembly of optimally configured Humabody® therapeutics for novel biology.